"A useful and intelligent guide for elevating the performance of any organization." 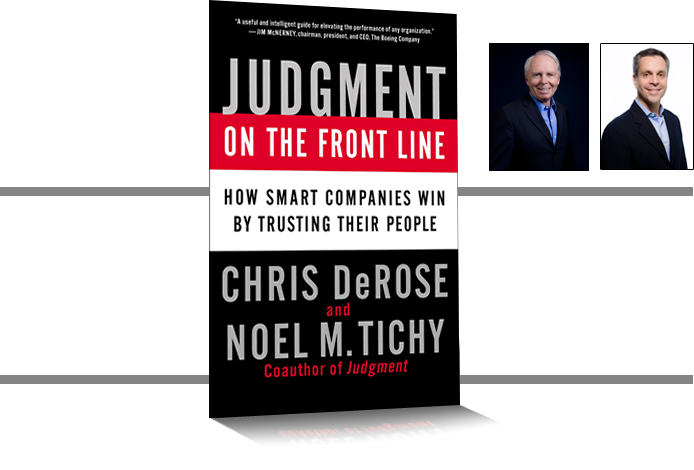 "DeRose and Tichy offer a practical, no-nonsense prescription for building an organization in which each person's voice can be heard and everyone's ideas can make a difference." DOUG OBERHELMAN, Chairman and CEO, Caterpillar Inc.
Share your story of frontline innovation or recognize someone and we'll send you a free copy of the book! Click to download Chapter 1 of the book! Special pricing available through this site only thanks to the publisher or buy directly from Amazon or Barnes & Noble. "Judgment On the Front Line"